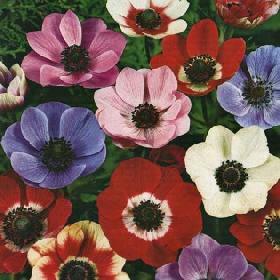 Anemone is a genus of about 120 species of flowering plants in the family Ranunculaceae, native to the temperate zones. It is closely related to Pulsatilla ('Pasque flower') and Hepatica; some botanists include both of these genera within Anemone. According to the Oxford English Dictionary, Greek anemōnē means "daughter of the wind", from ánemos "wind" + feminine patronymic suffix -ōnē. The Metamorphoses of Ovid tells that the plant was created by the goddess Venus when she sprinkled nectar on the blood of her dead lover Adonis. The name "windflower" is used for the whole genus as well as the wood anemone A. nemorosa. Flowers with 4-27 sepals are produced singly, in cymes of 2-9 flowers, or in umbels, above a cluster of leaf- or sepal-like bracts. Sepals may be any color. The pistils have one ovule. The flowers have nectaries, but petals are missing in the majority of species.